Jeopardy! valued that knowledge at $2000 about a year ago...contestant got it too. 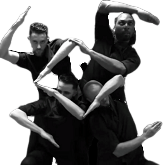 They are written about for art collecting as well as their business. Wouldn't say that's $5k level though. $50k, I'd accept with a sideeye, but $100k on, fair game. Board members sighting in today's 1/16 ep. My wife Naurae29 was the second contestant in today's episode. I admit that neither of us have been posting very much on these boards lately. This sparks a random thought. 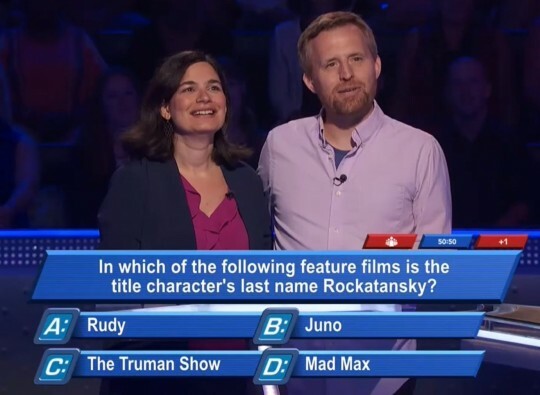 What is the trade between a Millionaire dollar value and a Jeopardy! dollar value? In Jeopardy, getting a question right doesn't earn you the money- you still have to win the game. On the other hand there are multipliers that increase the value of the assets you have already won if you choose to use them (daily doubles, final jeopardy), conditioned of course on the probability of actually getting those right. In Millionaire, once you get it right, you control that money. You may choose to gamble losing it, but that's your choice. So when you go from $10K to $20K that's truly an incremental $10K. So overall ... is a $2,000 clue in Jeopardy is worth less than a $2,000 clue in Millionaire? Mara used her 50:50 and it left Deer & Sheep. 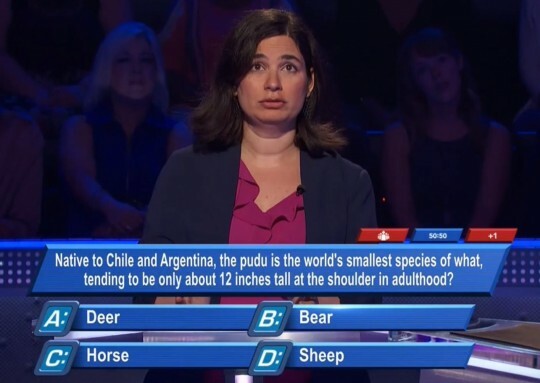 Mara walked with $30,000 and when Chris asked for a guess she went A: Deer which was correct. Deer seemed most likely to me, by reading that question. The Mad Max one I didn't know and guessed wrong. Congrats on playing a great game, Mara! $30k = Seen Rudy (Ruettiger) but not the others. Leaned Mad Max for no reason, glad I was right! $50k - Thought (correctly) of deer. Bob's book never occurred to me until seeing the previous posts.. guess it's been awhile. I checked both Merriam-Webster and the OED, and both confirmed my thought that bimonthly can mean either twice a month OR every two months. I'm absolutely baffled that they would use that question. #1: Which of the following’s the correct definition of biannual- twice a yr., every two yrs. or twice every other yr.? Sure, but they have biennial for every two years. That would have been my guess looking at that question. I agree. Whoever is editing their questions missed that peoblem. Fortunately, she chose correctly. Nice run, Naurae and skullturf! I reassured myself that the midpoint of January falls on the 16th. I know twice-monthly things don't necessarily get distributed evenly, but the use of the 15th rather than the 16th was enough to tell me they intended the options to represent biweekly, monthly, sesqui-monthly, and bimonthly.